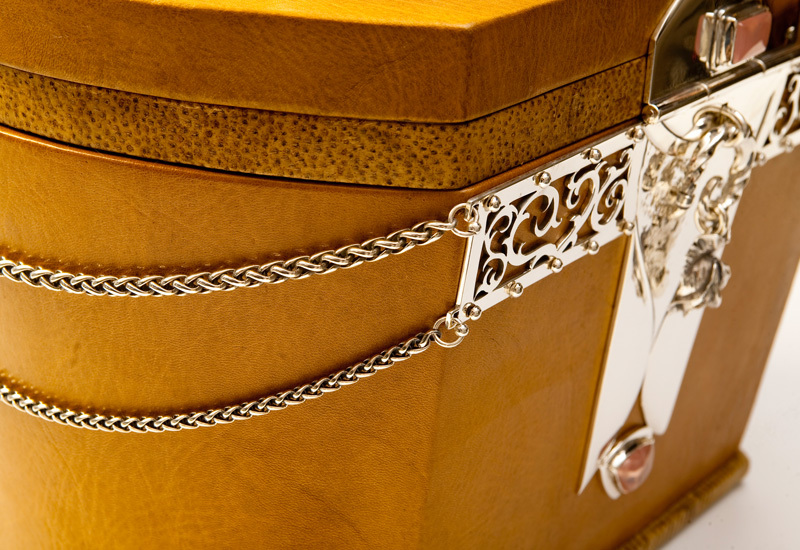 Gabriella was entrusted with a very special birthday commission to commemorate 40 years of life. 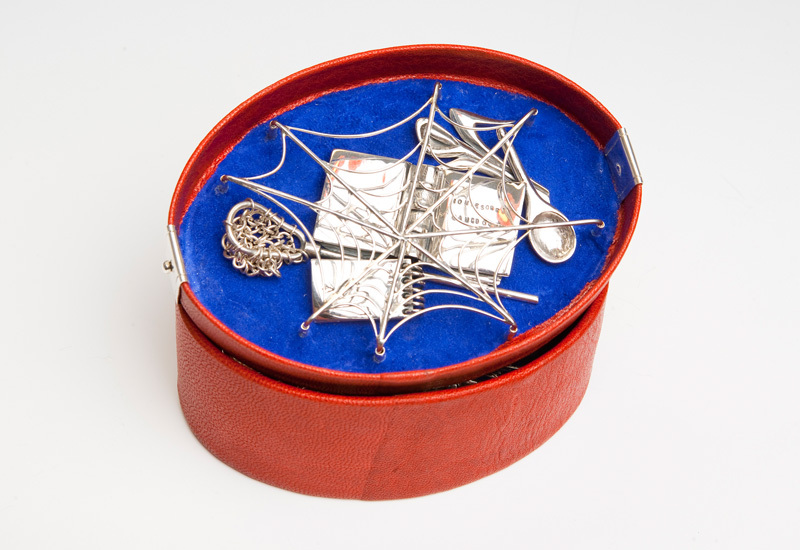 The present takes the shape of a box full of treasures and memories; every component crafted with the recipient's 'story' in mind. 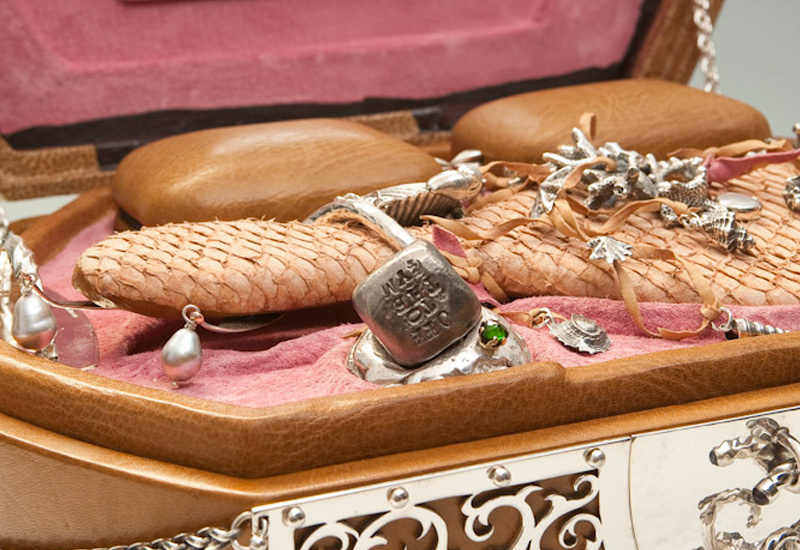 The box, inspired by vintage luggage, is bound in leather by Gavin Rookledge and comprises of three interior layers lined in rose pink suede. 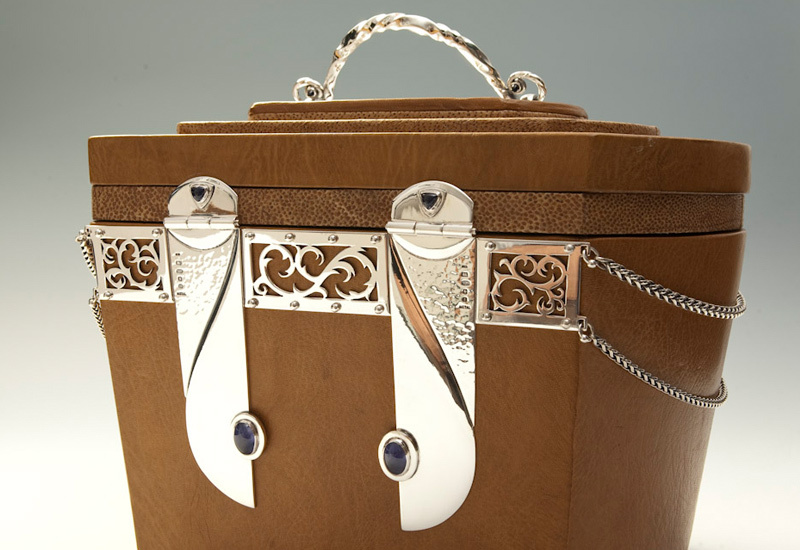 The exterior is embellished with silver work to lend the piece an art-deco feel and is finished with cabouchon rose quartz and iolite. 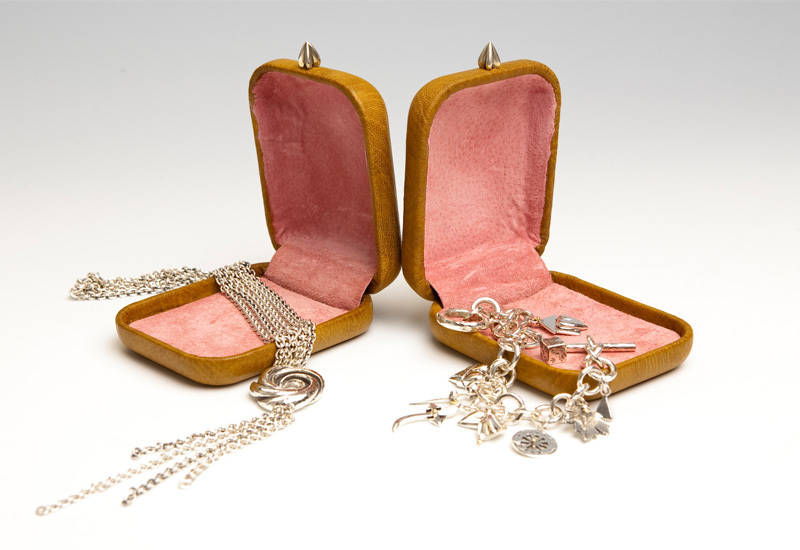 In the first layer you find two jewellery boxes, the first containing an Algerian love knot necklace engraved with the wedding date. 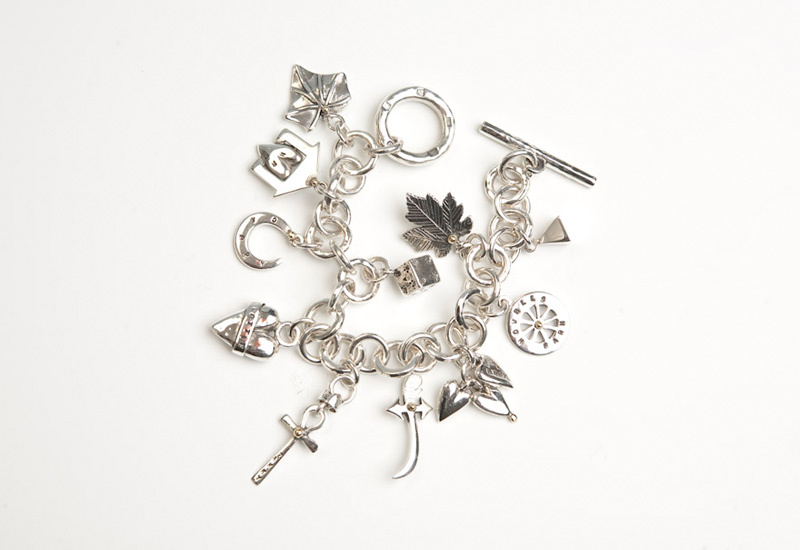 The other houses a charm bracelet to represent childhood & memories. 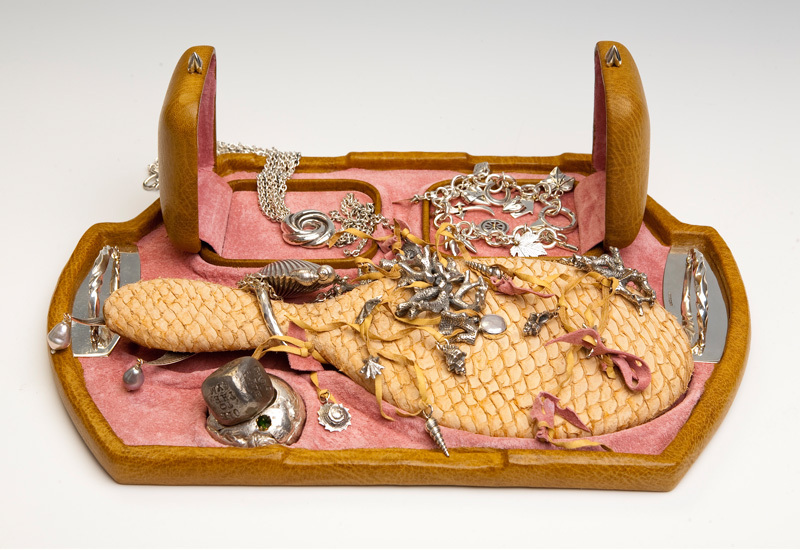 The centrepiece of the top layer is a mermaid's hand mirror to reflect island life; covered in fish skin and adorned with maritime charms. 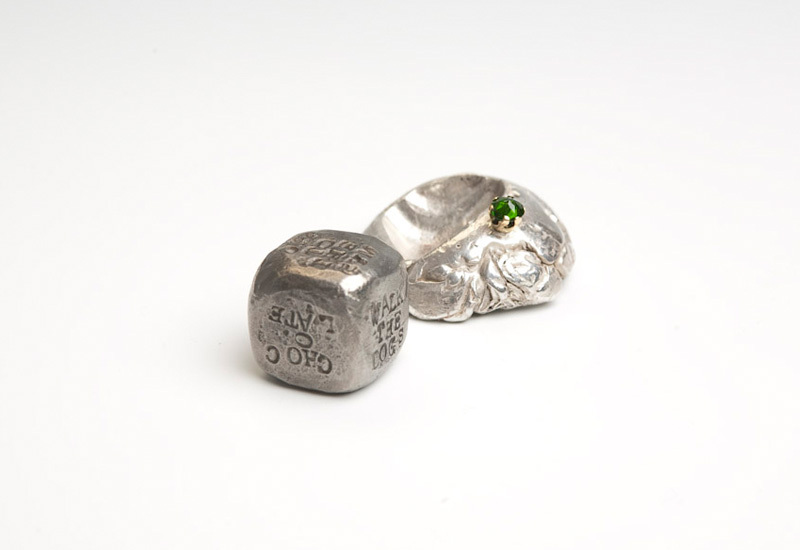 Shelley Thomas was commissioned to make the heavy light-hearted steel dice on it’s equally weighty silver gemset stand. 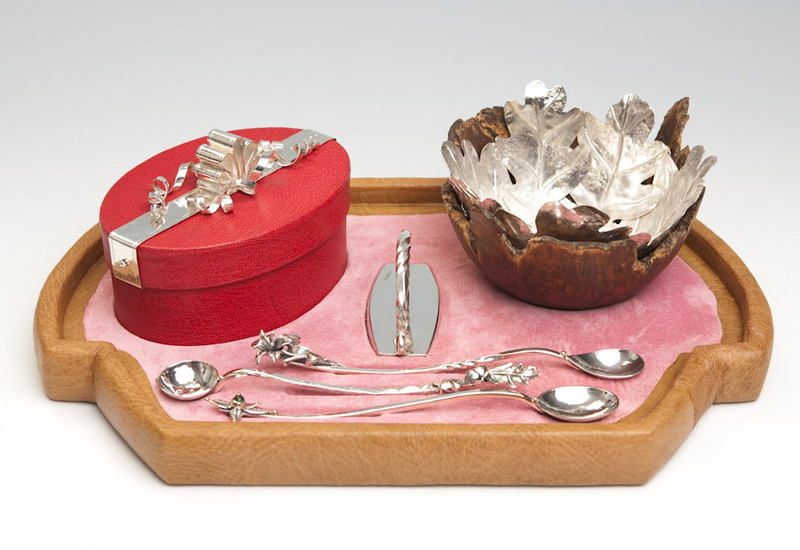 The middle tray holds a silver oak bowl with it’s second skin of turned Norfolk burr oak and represents family. 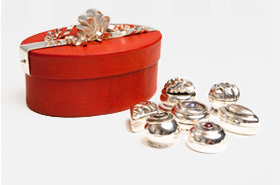 The red leather chocolate box with it’s silver ribbon stores seven life-size chocolates which twist open to reveal trinkets from inscribed silver doggy bones to friendship rings. 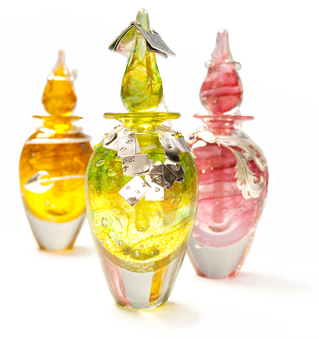 The three exquisite perfume bottles nestled in the bottom layer are hand-blown by Martin Andrews, they represent the children. 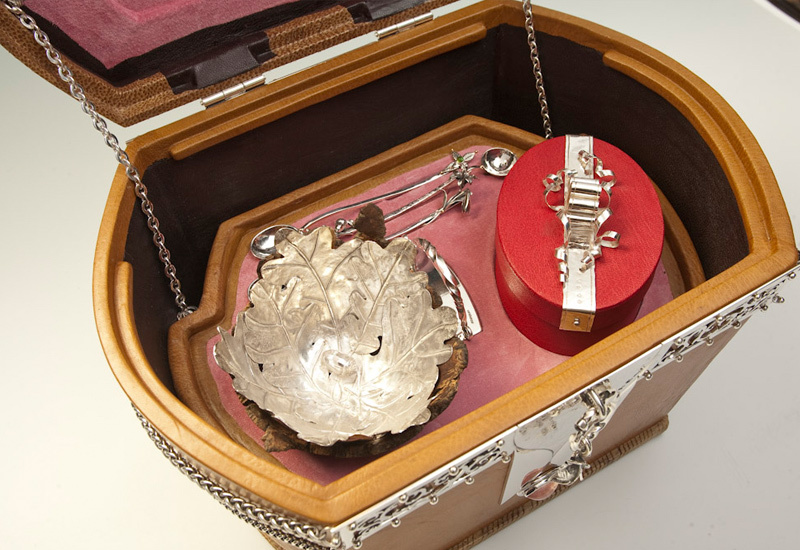 The silver collars are engraved with their names and are set with peridot, amethyst and citrine to compliment the vivid colours of the glass and are adorned with books, halos and feathers; suggestive of their characters. 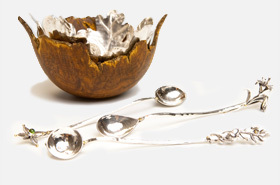 Complete with personalised spoons representing family members. 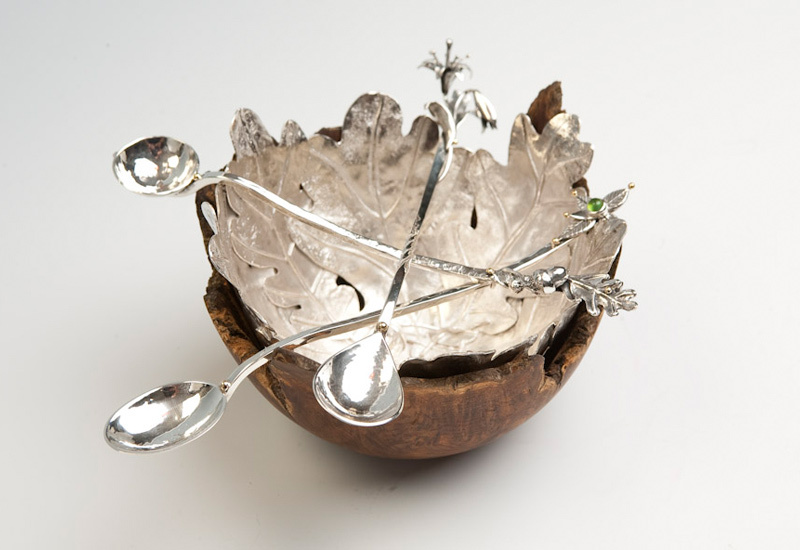 Finished with images of oak, Lily & a leaf compass. 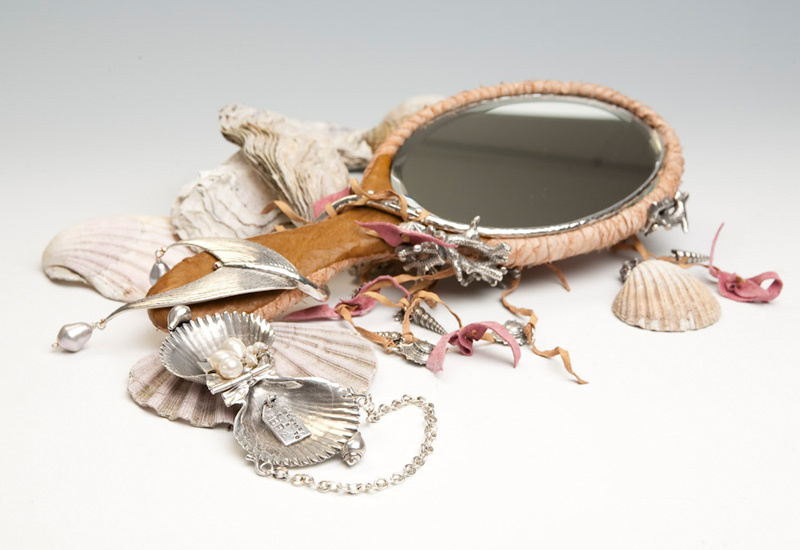 With the mirror comes a scallop shell handbag. 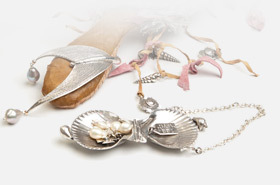 The winkle clasp snaps open to reveal pearl treasure. 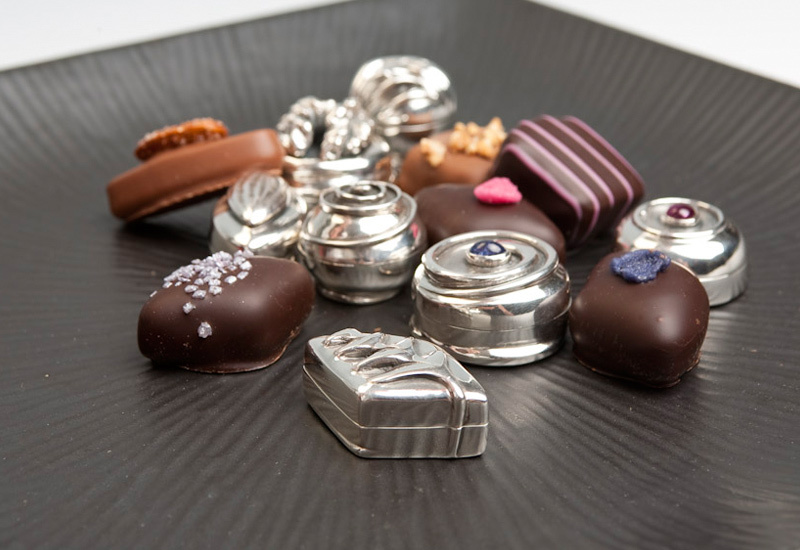 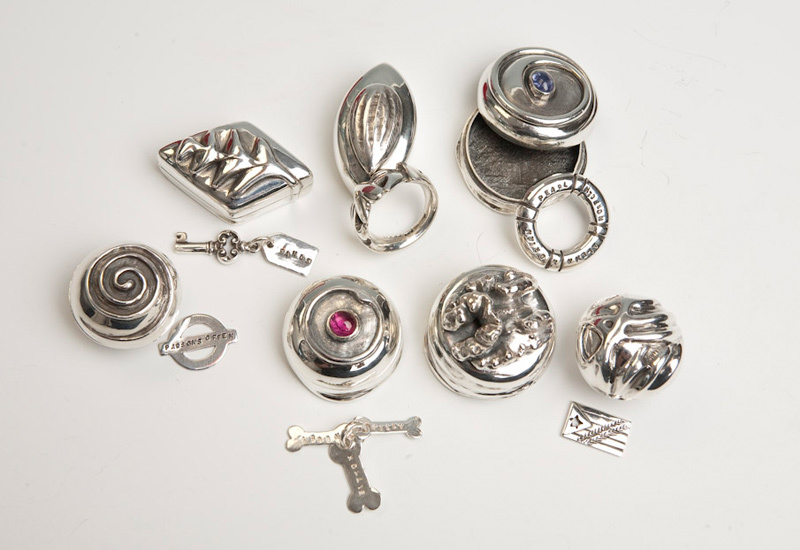 These cast silver treats look good enough to eat. 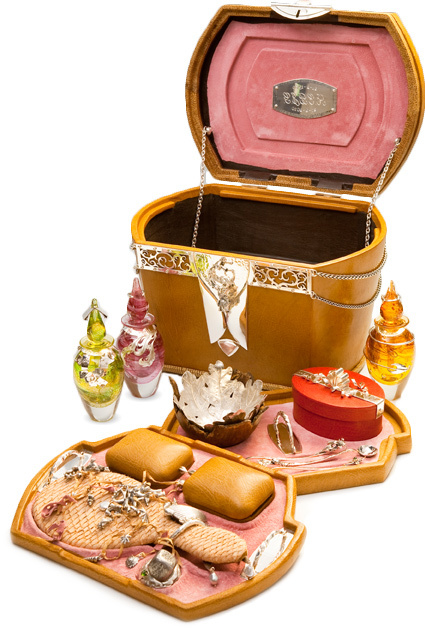 The rose and violet creams are topped with pink tourmaline and tanzanite. 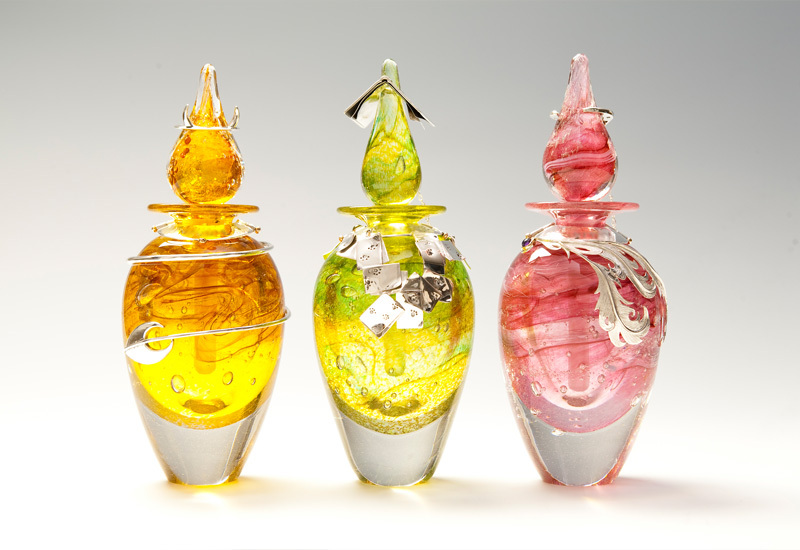 Interested in commissioning a piece by Gabriella?